It has been the force behind US monetary policy for at least the past two years. It can be captured by the behavior of the 1-year ahead expected FF rate, which coincides with the intensification of the “rate rise talk”. The chart below is a representative example, showing how policy started tightening long before the December/15 rate increase. The same is true if you chart inflation expectations, industrial production growth, stock market returns or oil prices alongside the FF future rate. 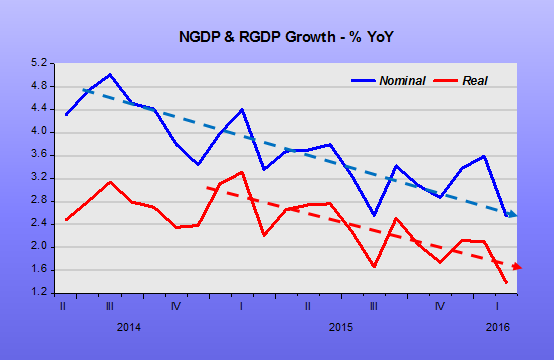 The “summary statistic” for the policy tightening stance is given by the declining behavior of NGDP (and RGDP) growth since mid-14. The fact is that the Fed has “abandoned” the inflation target, or is really content with the low inflation that has materialized in large measure as a consequence of the effective policy tightening. No wander the “recession talk” has been on the rise! But inflation has been moving away from the target, despite falling unemployment! Five years ago, the economy had already recovered from the financial crisis. Why did the Fed wait so long to “tell us”? Maybe only now they got tired of their “extended vacation”. That´s exactly what the Fed has been doing, inadvertently, over the past year by indicating “the time is coming”! That´s just misplaced faith. 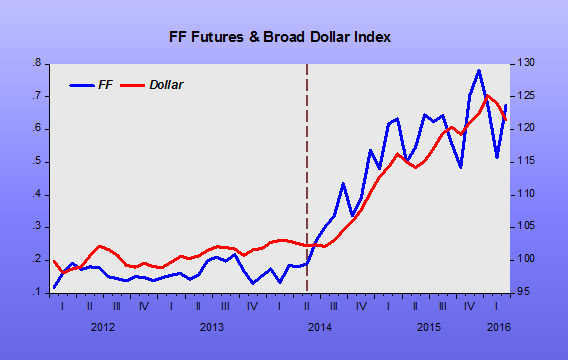 By their actions, the Fed is likely stifling the rise in the neutral FF rate. …Put more positively, if one takes the VAR evidence on monetary policy seriously (as we do), then any case for an important role of monetary policy in the business cycle rests on the argument that the choice of the monetary policy rule (the “reaction function”) has significant macroeconomic effects. …The results are reasonable, with all variables exhibiting their expected qualitative behaviors. In particular, the absence of an endogenously restrictive monetary policy results in higher output and prices, as one would anticipate. Quantitatively, the effects are large, in that a nonresponsive monetary policy suffices to eliminate most of the output effect of an oil price shock, particularly after the first eight to ten months. …The conclusion that a substantial part of the real effects of oil price shocks is due to the monetary policy response helps to explain why the effects of these shocks seems larger than can easily be explained in neoclassical (flexible price) models. …Substantively, our results suggest that an important part of the effect of oil price shocks on the economy results not from the change in oil prices, per se, but from the resulting tightening of monetary policy. This finding may help to explain the apparently large effects of oil price changes found by Hamilton and many others. In other words the explicit warning is: “Don´t impose a negative demand shock over a negative supply shock”. Therefore, it appears that Bernanke (and the Fed) imposed a massive negative demand shock on a significantly negative supply shock, comprising both an oil shock and a financial crisis! That´s the main cause of the Great Recession (which has morphed into the “New Normal” or “Secular Stagnation”). The house price boom and bust and the ensuing financial crisis, in addition to “second fidllers” in the drama, serve as the “strawmen” that exculpate the Fed and even helped turn its Chairman into Person of the Year, 2009, Hero and bestselling author! The story is illustrated below. 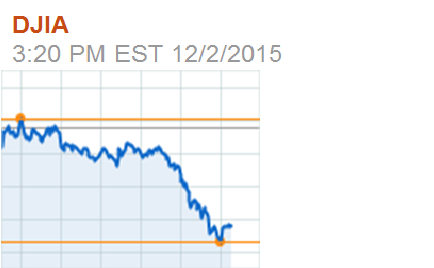 We start in late 2003, when the oil shock (could call it the “China shock”) began. 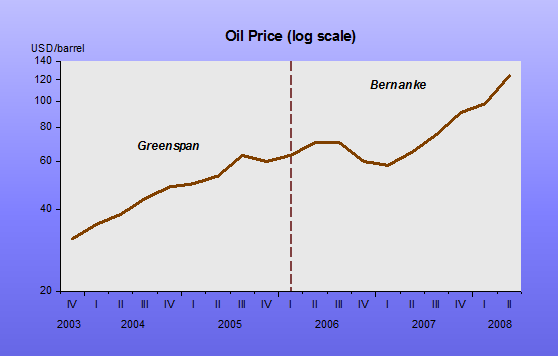 From then to mid-2008, the price of oil quadrupled. According to Bernanke, you shouldn´t “drink” from that fountain. 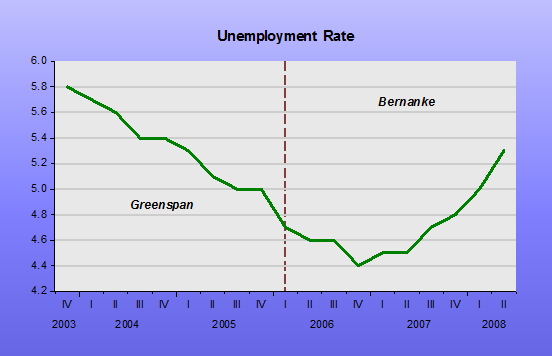 From 2003 to January 2006, it was Greenspan´s show. 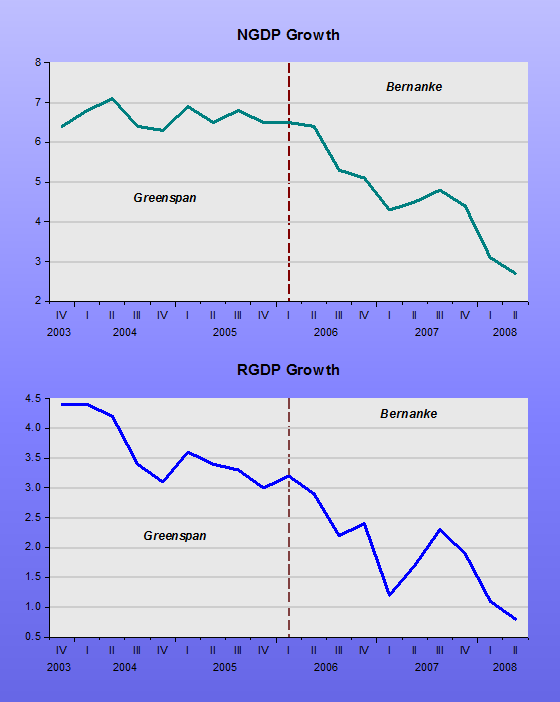 It appears that Greenspan followed Bernanke´s advice, and didn´t allow monetary policy (gauged by NGDP growth) to tighten. But Bernanke forgot his own counsel, and chose a monetary policy rule (strong reaction to the rise in headline inflation) with significantly negative macroeconomic effects. As we know, that was only the beginning. Things became much worse during the next 12 months. Let´s backtrack and ask the question: Was Greenspan lucky? The answer to this question leads us to examine in greater depth the role of monetary policy in generating the “Great Recession”. The Dynamic AS/AD model tells us that a negative (positive) AS (oil) shock will decrease (increase) real growth and increase (decrease) inflation. Bernanke et al very sensible conclusion from 1997 was that monetary policy should not react to those shocks. 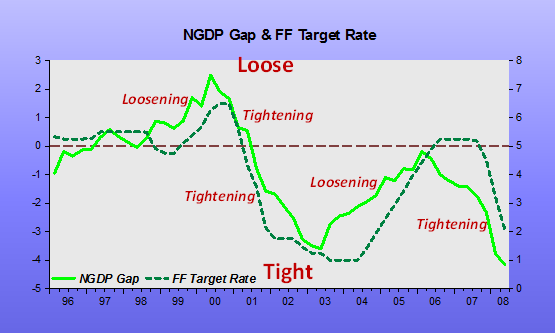 The chart below provides a view of the stance of monetary policy by looking at the NGDP gap. 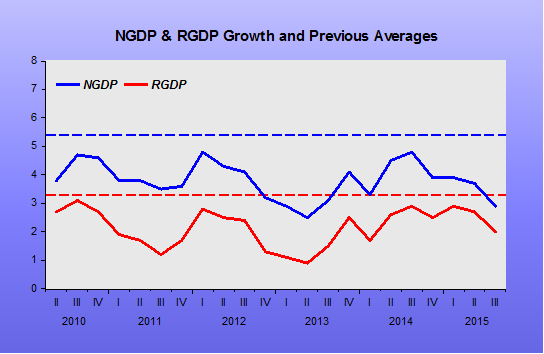 The NGDP gap is the deviation of NGDP from its stable trend path. Therefore, if, for example, NGDP is rising above trend, monetary policy is deemed “loose” and “loosening”. Other cases are illustrated in the chart. 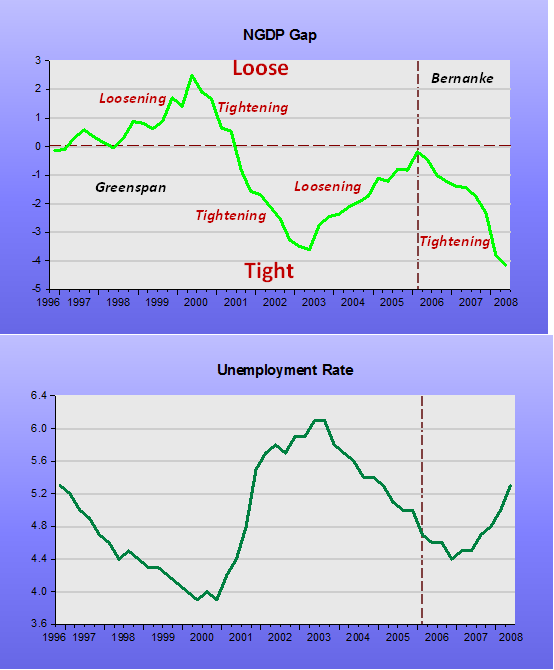 The unemployment rate stands as counterpart for the real effects of monetary policy. In the second half of the 1990s, the economy experienced a positive (productivity) supply shock. 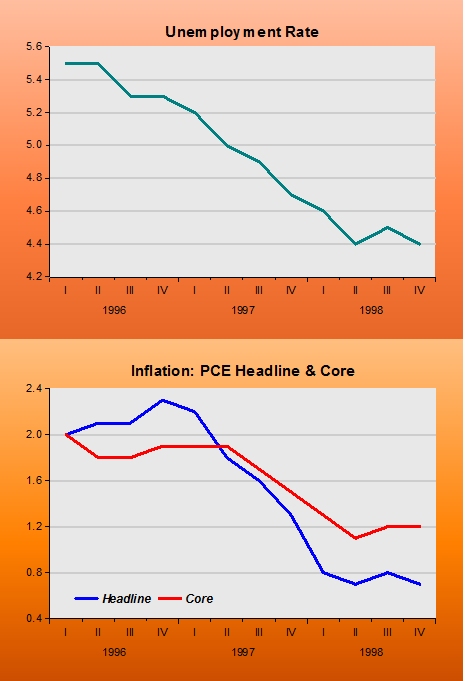 According to the DASAD model, inflation falls and real growth increases (unemployment falls). The chart above tells us that Greenspan allowed monetary policy to loosen, magnifying the growth and employment effects of the shock. When unemployment dropped below 4%, the “Phillips Curve/Slack crowd” took over and monetary policy tightened. The Fed “overtightened” monetary policy [note: despite interest rates falling fast], as NGDP continued to fall below trend. In mid-2003, the Fed adopted “Forward Guidance”, in effect “loosening” monetary policy, so that NGDP began to climb back to trend. If you refer to the NGDP growth chart at the beginning, you will notice that NGDP was growing at the high rate of 6.5% from late 2003 to early 2006. That´s the only way NGDP can climb back to trend, i.e. by growing for a time at a rate above the trend growth rate of around 5.4%. Greenspan was “lucky” because, when the oil shock hit, monetary policy was on a “correction” trend, and thus minimized the negative real growth effect of the shock, with the unemployment rate even turning down. When Bernanke took the helm, NGDP was “on trend”, i.e. 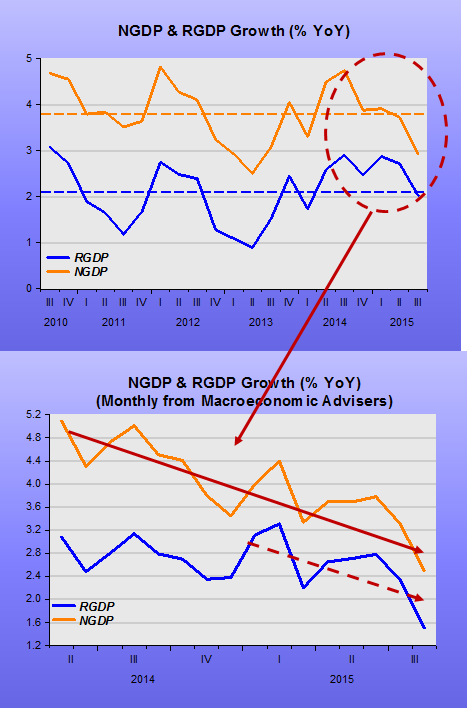 NGDP growth was “just right” to provide a “stable monetary background”. But he forgot what he had known for 10 years and adopted a monetary reaction function focused on headline inflation. With the ongoing and even strengthening oil shock, monetary policy was tightened with NGDP falling below trend at a fast pace. At that point, another Great Depression was in the making, so Bernanke, faithful to his credit channel view of the propagation of the Great Depression, came quickly to the rescue of banks. 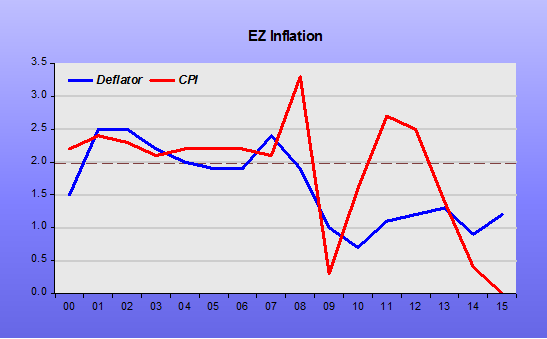 Monetary policy, however, remained tight and was only weakly loosened with the introduction of QE1 in March 2009. 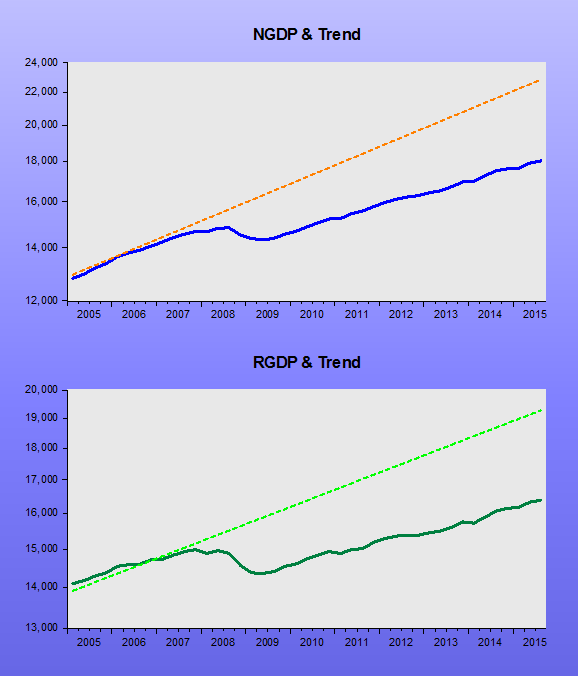 NGDP and RGDP growth recovered, but for the past five years have remained at a level well below the previous trend growth rates; no wander the monikers “New Normal” and “Secular Stagnation” have become household words! The Blanchard et all paper rationalize this state of affairs by indicating that “even recessions triggered by demand shocks are often followed by lower output or even lower output growth”. That sort of reasoning forgets that one thing monetary policy can avoid, or at least minimize the effects of, are demand shocks! Moreover, as Bernanke told us in 1997, monetary policy can also minimize the output effects of supply shocks, particularly by not reacting to those types of shocks. One did badly because of banking and debt crisis. The other did well because of fiscal stimulus! Interestingly, the economies that didn´t experience a recession (or a financial crisis) in 2008-09, like Australia, Israel and Poland, are the ones in which monetary policy managed to keep NGDP growth close to trend! That seems to be just luck because Stanley Fischer, now Vice-Chairman of the Federal Reserve Board, at the time was head of the Bank of Israel, and from his recent utterances still has no idea why he was successful! You easily conclude that the economy will likely get worse! One point emphasized by both the Blanchard et al and Larry Ball´s article, is the concept of hysteresis (and super-hysteresis), which concerns the level (and growth rate) of real output following real or nominal shocks. The chart below casts some doubt on the idea, at least for the US. 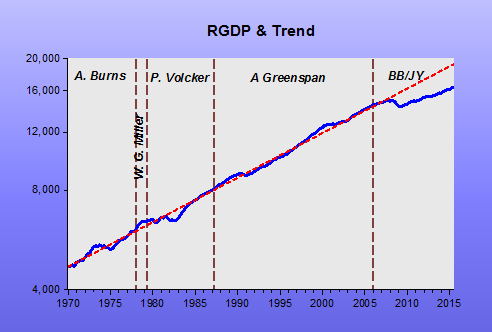 Even the oil shocks of the 1970s or the demand shock from Volcker’s disinflation did not permanently reduce the level or growth rate of real output, which always returned to trend (the trend in the chart was formed from 1970 to 1997). The more recent Bernanke/Yellen supply/demand shock has worked out differently, with both the level and growth rate of output forcefully reduced, i.e. denoting hysteresis/super-hysteresis! As argued above, that comes mostly from the misconceived monetary policy adopted since Bernanke took over. That policy has drastically reduced both the target level of NGDP and its growth rate. The charts illustrate for the most recent period. The real damage is that now the much lower level and growth rate of real output have become the “New Normal”! The chart below well describes the inadequacy of using interest rates to gauge the stance of monetary policy. Interest rates, in fact, say that monetary policy is loosening when it is tightening, and vice-versa! That is consistent with Friedman´s saying from 1968: “low interest rates indicate that monetary policy has been tight and high interest rates that it has been easy”. Another point often made, especially by the people at the FOMC, is that the unemployment rate is down to levels that indicate the economy is running out of slack (so policy must be “tightened”). I find it wrong to reason from an unemployment change when unemployment at present means something possibly very different from what it meant in previous decades. 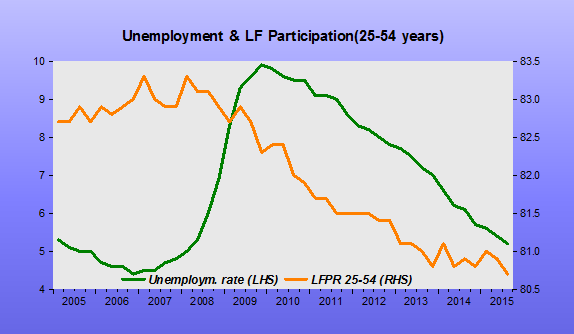 The chart illustrates that at present, both unemployment and labor force participation rates are falling. In previous periods, a fall in unemployment went together with increasing or high labor force participation. The tight coincidence between the fall in participation rates and the deep drop of NGDP below trend also make me skeptical to attribute any significant share of the drop in participation to structural/demographic factors. Here also, most of the damage to the labor market lies in the hands of the misguided monetary policy adopted by the Bernanke/Yellen Fed! They feel that “the time has come to “tighten” monetary policy”. By misunderstanding monetary policy, they ignore that for the past year monetary policy has been tightening, with implications for the dollar and oil prices! And, being clueless, they think the low inflation is something temporary that is due to the oil and exchange rate effect. 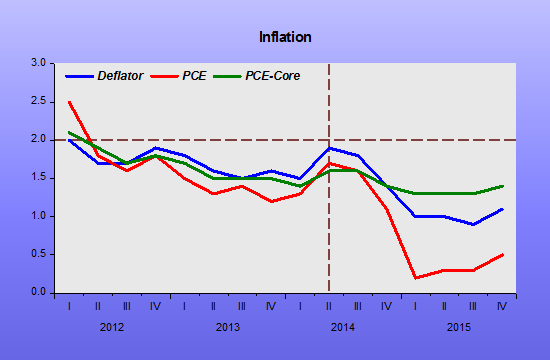 In other words, monetary policy is even absent from direct discussions of inflation! By staying pat on the FF rate, but constantly saying they “would like to begin to normalize policy” this year, Janet & Friends are in effect enlarging the hole that will eventually sink the ship! Why have they been procrastinating for so long? As history attests (here, here see notes below)), the Fed is terribly afraid of being accused of having sunk the ship. They just don´t see that they are doing exactly that, so far in “slow motion”! The Fed did not raise rates at the September FOMC meeting (nor after the November election). It did a “one and done” in March 97. And below inflation and unemployment.